As the summer season is setting in, so is the need to keep yourself hydrated in order to beat the heat and fatigue. The Pitta Dosha, which is responsible for our body's metabolism and digestive functions, requires to be balanced with the right kind of food and drinks for one to be able to strike an overall harmony between the mind and body. Associated with heat, the Pitta Dosha's adverse effects, if not kept in check, are especially felt during the hot summer months. This can be achieved by consuming a number of natural, Pitta-cooling drinks such as the following. 1. 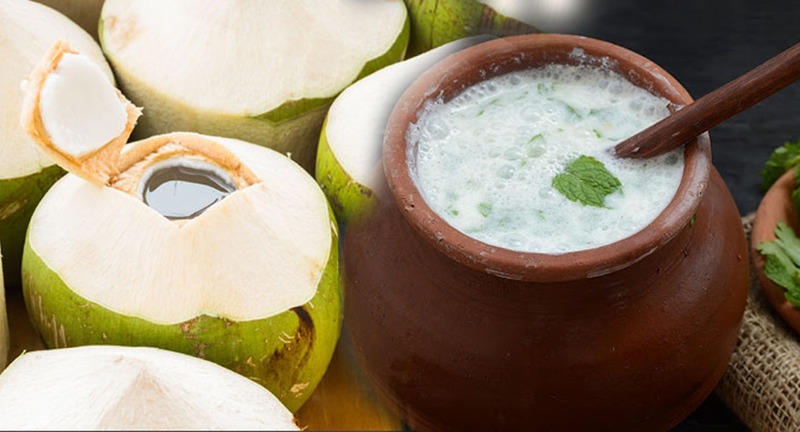 Tender Coconut Water Dubbed as the "world's safest, natural soft drink", tender coconut water can be consumed during the peak hours of a summer day to quench your thirst as well as render your mind and body with the much needed nutrition it deserves. Tender coconut water is known to balance acid levels, cool the system and flush toxins out of the body. 2. Herbal or Green Tea Herbal or green tea consumed in right quantities (2-3 cups a day) can boost your immune system, owing to the high levels of antioxidants found in it. Tasked with protecting cells from daily exposure to toxins, such as cigarette smoke or pollution, they are quite effective at keeping your immunity levels in check. For E.g. Cumin seeds, mint, fennel seeds, rose petals, etc. 3. Buttermilk Commonly known as ‘neer mor’ or just ‘mor’, buttermilk has a special significance in ayurveda for its easily digestible and cooling nature, along with the ability to pacify the Pitta Dosha especially when mixed with sugar. Buttermilk is also known as ‘Takra’ in ayurveda and is utilized for the Takradhara Panchakarma therapy. 4. Fresh Juice Drinks like watermelon or muskmelon juice and concoctions such as cucumber, gooseberry and mint leaves are some of the freshly prepared juice varieties that relieve you off the extreme heat and cools down the body. These drinks also have the benefit of being highly nutritious in addition to beating the summer heat. 5. Water Drinking water consumed from a copper vessel or a earthen pot is known to have several health benefits when weighed against water that is filtered/treated or stored in a plastic bottle. The daily minimum intake of 3 to 4 litres (or more) of water can do wonders to the human body, more so when they are poured out of the copper vessel or earthen pot.